Jonathan Fishman, Robin Youngs, Edward Fisher, Musheer Hussain,	The Journal of Laryngology & Otology, Volume 130 Issue 10, pp 887-888. A J F Millington, A C Gaunt, J S Phillips,	The Journal of Laryngology & Otology, Volume 130 Issue 10, pp 889-892. R H Easto, V Reddy,	The Journal of Laryngology & Otology, Volume 130 Issue 10, pp 893-896. N Apaydin, S Çomoğlu, Y Özer, H Avci, H Eş, K S Orhan,	The Journal of Laryngology & Otology, Volume 130 Issue 10, pp 897-901. L Shi, J Chen, J Li, X Wei, X Gao,	The Journal of Laryngology & Otology, Volume 130 Issue 10, pp 902-906. A Mishra, V Singh, V Verma, S Pandey, R Trivedi, H P Singh, S Kumar, R C Dwivedi, S C Mishra,	The Journal of Laryngology & Otology, Volume 130 Issue 10, pp 907-913. N Nishio, Y Fujimoto, K Suga, Y Iwata, K Toriyama, K Takanari, Y Kamei, T Yamamoto, M Gotoh,	The Journal of Laryngology & Otology, Volume 130 Issue 10, pp 914-922. M B Avnstorp, P V F Jensen, T Dzongodza, N Matinhira, C Chidziva, J Melchiors, C Von Buchwald,	The Journal of Laryngology & Otology, Volume 130 Issue 10, pp 923-927. 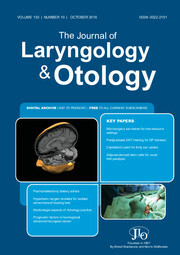 A Akyigit, Ş Yalcin, E Ö Etem, İ Kaygusuz, T Karlidag, E Keles, Z B Celik, A Tektemur,	The Journal of Laryngology & Otology, Volume 130 Issue 10, pp 928-933. S Turkoglu Babakurban, O Topal, E Aydin, E Hizal, S Copur, M Demirbilek Ekici,	The Journal of Laryngology & Otology, Volume 130 Issue 10, pp 934-938. G Isaacson, D C Ianacone, A M S Soliman,	The Journal of Laryngology & Otology, Volume 130 Issue 10, pp 939-942. Is hyperbaric oxygen therapy a salvage treatment option for sudden sensorineural hearing loss? Y Alimoglu, E Inci,	The Journal of Laryngology & Otology, Volume 130 Issue 10, pp 943-947. T S Santos, R Estêvão, L Antunes, V Certal, J C Silva, E Monteiro,	The Journal of Laryngology & Otology, Volume 130 Issue 10, pp 948-953. M P A Clark, B D Westerberg, J E Mitchell,	The Journal of Laryngology & Otology, Volume 130 Issue 10, pp 954-961. S G Mistry, D R Strachan, E L Loney,	The Journal of Laryngology & Otology, Volume 130 Issue 10, pp 962-966. A Nor Rahimah, F I Shahfi, M Masaany, N Gazali, S H Siti,	The Journal of Laryngology & Otology, Volume 130 Issue 10, pp 967-968. J Overland, J C Hodge, O Breik, S Krishnan,	The Journal of Laryngology & Otology, Volume 130 Issue 10, pp 969-972. U C Megwalu,	The Journal of Laryngology & Otology, Volume 130 Issue 10, pp 973-974. P Karthikeyan, D T Pulimoottil,	The Journal of Laryngology & Otology, Volume 130 Issue 10, p 975. R W A Hone, I J Nixon,	The Journal of Laryngology & Otology, Volume 130 Issue 10, pp 975-976. The Journal of Laryngology & Otology, Volume 130 Issue 10, pp -. Elfy B Chevretton, Sherif Haikel, Ann Sandison, Ata Siddiqui,	The Journal of Laryngology & Otology, Volume 130 Issue 10, pp -. Elfy B Chevretton, Sherif Haikel, Ann Sandison, Steve Connor, Ata Siddiqui,	The Journal of Laryngology & Otology, Volume 130 Issue 10, pp -.